Many librarians and teachers write to me, asking for reliable sources on American Indian culture, history, etc. They seek these resources in order to support student research projects. As many of you know, there are a LOT of materials available on American Indians, but, many (I'd say most) are outdated and/or biased in ways that continue to present American Indians as victims, savages, or tragic heroes. I'm really glad people are seeking other materials. I trust they'll use these materials to write materials for teachers to use, and if you're a writer, I hope you use these materials so that you do not replicate errors and stereotypes. So! Here's my suggestion on how to proceed. Davis, Mary B. 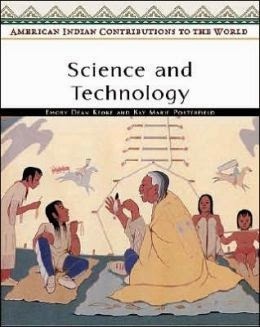 (1996) Native America in the Twentieth Century: An Encyclopedia. New York: Garland Publishing Inc.
Hoxie, Frederick E. (1996) Encyclopedia of North American Indians. New York: Houghton Mifflin. ALSO, get these three books. They are also excellent and teachers/librarians/students will find them helpful. FINALLY, when using the web, make sure students go to Elaine Cubbins website BEFORE they start using the web to find material on American Indians. She, too, is in the American Indian Library Association. Her page is about evaluating webpages with Native content. All these resources are listed somewhere here on my blog. The encyclopedias and books are at the bottom of my recommended books list, and the websites are listed in the section of my page called "Excellent Websites about American Indians." Or, you can order it in a single volume, under the title Encyclopedia of American Indian Contributions to the world: 15,000 Years of Inventions and Innovations. The single volume, also by Keoke and Porterfield, was published in 2003. Read the scholarship and research of people in American Indian Studies! See "Native Professional Associations and Journals" on the left (scroll down). Is that Native American Encyclopedia website any good? Dunbar-Ortiz, Roxanne. An indigenous peoples' history of the United States. Beacon Press, 2014. Mankiller, Wilma, and Rick West. Do All Indians Live In Tipis? : Questions and Answers from the National Museum of the American Indian (2007). Treuer, Anton. Everything you wanted to know about Indians but were afraid to ask. Borealis Books, 2012. As a selector of materials for a large public library system I am very interested in your recommendations. Our difficulty with the research recommendations is the sources that you listed are more than ten years old. We have "weeding" guidelines that usually consider those materials inaccurate for current information. There have been a number of Native American encyclopedias and tribal guides published since then. I'm hoping that you can recommend something newer. Thanks for all your efforts! There are newer books, but if they carry the same bias as older ones, they aren't any better than the older ones. The ones I recommend are excellent for the reasons I stated. Surely there is flexibility in the guidelines! I am a high school librarian and was very interested to read your recommendations of sources to use for student research projects. I am currently taking a course called American Children’s Literature for Children and have two papers to write. I am now planning to look for your recommended sources to look at for my own research. Of the titles that you mention, our district owns 1 and my building owns none. I am happy to report however that my building does have a copy of the more recently published, Encyclopedia of American Indian Contributions to the world: 15,000 years of inventions and innovations. The techniques for evaluating American Indian Web Sites link will be very helpful and is right in line with all the “standard” criteria of website evaluation, one of the literacy skills that librarians teach. I am looking forward to spending more time looking at Lisa Mitten’s website and exploring the American Indian Library Association. Thank you for pointing out these resources to teachers and librarians.